PUNTA GORDA, Fla. Sept. 27, 2018 — Allegiant (NASDAQ: ALGT) today is celebrating its continued success in Florida and more than 40 million travelers transported through The Sunshine State by giving everyone on Flight 1305 from Punta Gorda Airport (PGD) to Cincinnati/Northern Kentucky International Airport (CVG) a refund for the airfare portion of their itinerary. Annually the company generates billions in economic benefit and supports more than 42,000 jobs in Florida. Since 2009, more than 5.5 million Allegiant travelers have traveled through Punta Gorda Airport (PGD) on nonstop, affordable flights. Allegiant currently offers 42 routes to PGD. Nonstop, affordable flights on Allegiant have made vacations possible for people across the country and have contributed to more than 1.7 million new visitors to The Sunshine State. Allegiant’s Florida service generates more than $4.1 billion in annual economic benefit and supports over 42,000 jobs, according to a recent study by Campbell-Hill Aviation Group. Allegiant began service in Florida on May 26, 2005 with four routes from Orlando Sanford International Airport (SFB). 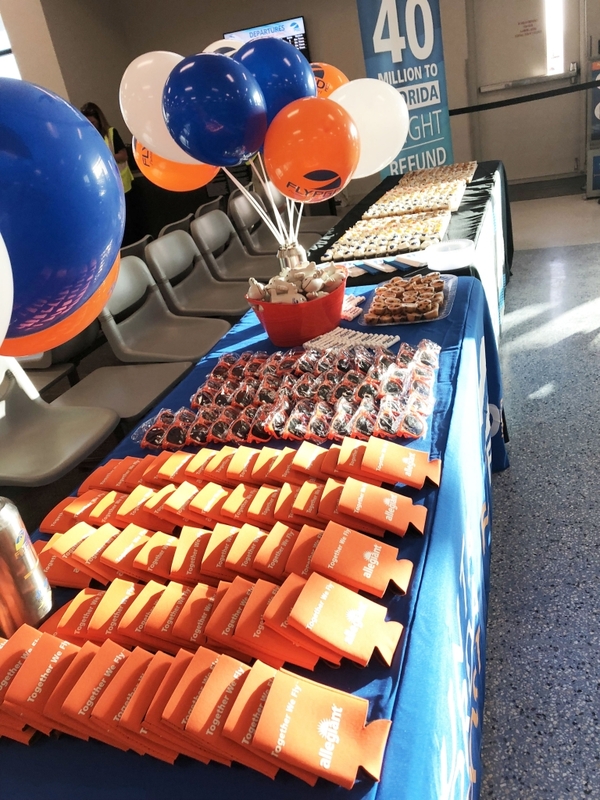 Since 2005, Allegiant has continued to grow in The Sunshine State, currently offering 223 routes to seven destinations, including: Destin / Fort Walton Beach, Fort Lauderdale, Fort Myers / Punta Gorda, Jacksonville, Orlando / Sanford, Sarasota / Bradenton and Tampa / St. Pete. Travelers can book their entire vacation on Allegiant for less at Allegiant.com. Las Vegas-based Allegiant (NASDAQ:ALGT) is focused on linking travelers to world-class leisure destinations. The airline offers industry-low fares on an all-jet fleet while also offering other travel-related products such as hotel rooms and rental cars. All can be purchased only through the company website, Allegiant.com. Beginning with one aircraft and one route in 1999, the company has grown to over 80 aircraft and more than 300 routes across the country with base airfares less than half the cost of the average domestic roundtrip ticket. For downloadable press kit, including photos, visit: http://gofly.us/ToZT30iauev.